I remember many years ago, I believe I was in high school. I was watching the news and heard them mention Bill Cosby's son was dyslexic and he was speaking somewhere about dyslexia. My thought when I heard this was how awful to have have something like that, I wouldn't know how to live. Well years later the sweetest little green eyed girl with pig tails taught me just how you can live with dyslexia. I've mentioned our struggles with dyslexia and even have a page that chronicles some of what we have dealt with. I didn't know I was dyslexic until until we took Em to be diagnosed. I knew when I do math my numbers move around but I just thought I was crazy or maybe just had bad sight. I also thought I was a bad speller. I didn't know all those factors was because I am mildly dyslexic. I managed to to work around my problems so no one knew. I ave noticed as I've gotten older my symptoms have gotten worse. Thank God for spell check. It took hitting a wall with the wittiest kid I knew. Wondering why she could remember everything since she was 3 but couldn't remember words on her spelling or sight word list. Why homework was a nightmare that took hours every night, yet when I picked her up from school she could quote word for word everything her teacher had said during the day. I'll spare you the details but over the years I've watched her overcome a mountain of obstacles to get where she is. 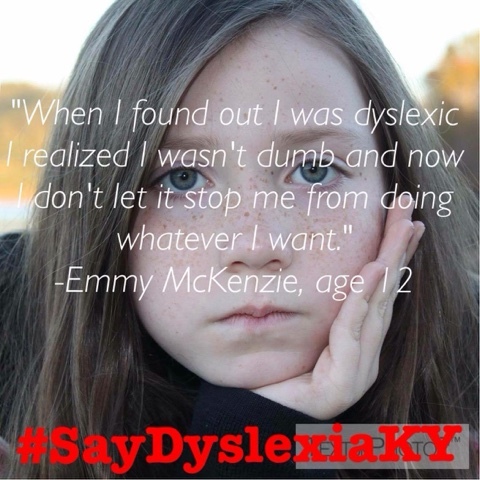 So when I was called and asked for a quote from Emmy on how her dyslexia has affected her. I had no idea that the finished product would be a meme. My baby gets to be a poster child for dyslexia awareness. I never in a million years expected that our story would touch others and that others would benefit from everything we've gone through. But here we are 4 years after our journey began and Emmy's story is being shared by people I don't even know but people who want others to know that a diagnosis of dyslexia is not a death sentence. You can not only live but succeed.